Charlie is 10 years old and has lived in a home for 6 years. 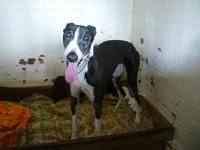 He did not come from Whittingham Kennels but was taken in by us in May 2011 when his owners said they were moving house and could no longer keep him. Left un-treated Charlie will become intolerant to exercise, heat, stress or anything which puts the slightest burden on his already lessening ability to take in air. Eventually it will cause collapse and death from lack of oxygen. Charlie’s condition can be successfully treated with surgery with entails tying back one of the laryngeal cartilages thus opening the larynx and allowing normal breathing. Unfortunately the required surgery is expensive (estimated to be between £1000 and £2000) and way beyond the means of Whittingham Kennels which relies very much on donations for it’s day to day running. Charlie can only be saved if we can raise the funds through the generosity of people like you and your friends. So if you are able I would be very grateful for any amount that you can spare. A real bonus would be to find him a loving home … We would take him, if it wasn’t for the fact that we have only 6 weeks ago re-homed another retired greyhound and now have 2 hounds already. Jim Roberts who has been one of Whittingham volunteers since 2000 is coordinating the fund-raising for Charlie. You can also call him on 01268 414123 if you need any further information. This entry was posted in appeal for Charlie the greyhound and tagged appeal for Charlie the greyhound, greyhounds, Johanna Beumer OBE, Laryngeal Paralysis, retired greyhounds, Whittingham Kennels. Bookmark the permalink.